Peter Hay, exhibits director at the Durango Arts Center, with one of his silt paintings in the exhibit titled, “Shroud,” now showing through Sept. 2. “My work stems from my need to investigate the natural world,” Peter Hay said in an interview last week at the Durango Arts Center. He and I sat in the DAC Library surrounded by five works on paper and 10 small oil paintings that appeared to be portraits of stones. “Shroud” is Hay’s first solo show at DAC. He arrived in Durango during summer 2015 to become the exhibits director at the center. His arrival coincided with an ecological disaster that garnered local, regional, national and international attention. 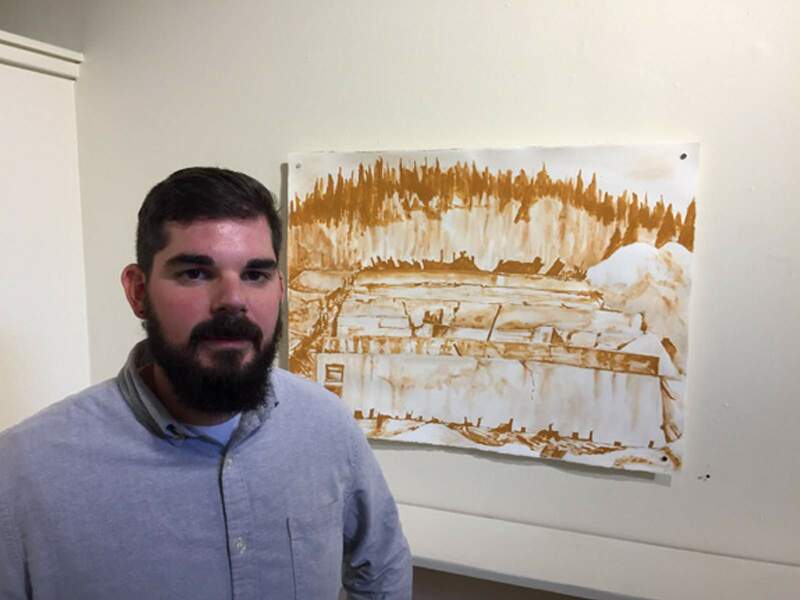 And for a young painter and printmaker whose artistic practice is connected to long-standing environmental concerns, the Gold King Mine spill immediately captured his attention. “I’m concerned about the natural world – how I fit into it, and how it has come to be the way it is,” Hays said. A childhood in Ponca City, Oklahoma, found him exploring streams, drainage ditches and nearby fields. But later, he witnessed the decline of his hometown via hundreds of contaminated houses bought out by an oil company and algae-choked streams. Hay’s undergraduate degrees from Oklahoma and a master’s degree from Louisiana Tech University led to arts administration positions, first in Tulsa and now in Durango. Hay’s DAC exhibit has one title, “Shroud,” but two parts. The drawings on paper fully express the title’s idea that there is more to see than what you see in landscape. Bold gestural renderings show a river landscape and mine structures. They appear to have been created with a rich gold ochre pigment. Instead, Hay collected contaminated silt from Cement Creek and used it rather than commercial pigment. Yes, the medium is the message. Part II, Unearthed, consists of 10 small, square oil paintings, portraits of pebbles Hay picked up at the mine site. They are carefully, almost lovingly, observed and depicted with all the painterly bravado of an 18th century still life. Back in his studio, with sketches and pebbles in hand, Hay said he questioned what it all meant. That’s the way conceptual artists operate – here’s an object, an image, and my experience. How do I connect all of that and create something new? Look closely at the stone portraits. Hay enlarged them to give them an aura of monumentality. Stand to the side and you’ll see an orange shadow. Hay painted the backs orange to evoke the color of the contaminated river. And he’s hung the paintings away from the wall to create the shadow. What: “Shroud,” an exhibit of works by Peter Hay. When: 10 a.m.-5 p.m. Tuesdays through Saturdays. Show runs through Sept. 2. Where: Durango Arts Center Library, 802 East Second Ave.
More information: Call 259-2606 or visit www.durangoarts.org.